The New England coastline is dotted with beachfront homes, ranging from charming Cape Cod and cottage-style homes to resplendent estates complete with stunning backyard pools, exquisite pool houses and terraces that offer sweeping views of the water. Used both as summer escapes and year-round residences, beachfront homes epitomize the nautical lifestyle New England is known for. Think about how you will use the home. Will this house serve as a year-round residence, or a vacation home? Consider the activities you want to enjoy, and how feasible it will be to access them from your home. For example, do you and your family enjoy kayaking, or prefer fishing or boating? If the latter, the size of the boat may play into your scope of your property. Perhaps simply taking in the view is enough to savor summers in your beachfront home. Get to know the community. Whether you plan to live in your beachfront home all year or just during the summer, you will still be part of the neighborhood. While all beachfront homes offer idyllic seaside living, each community along the coastline is unique. Find the one that feels like home. 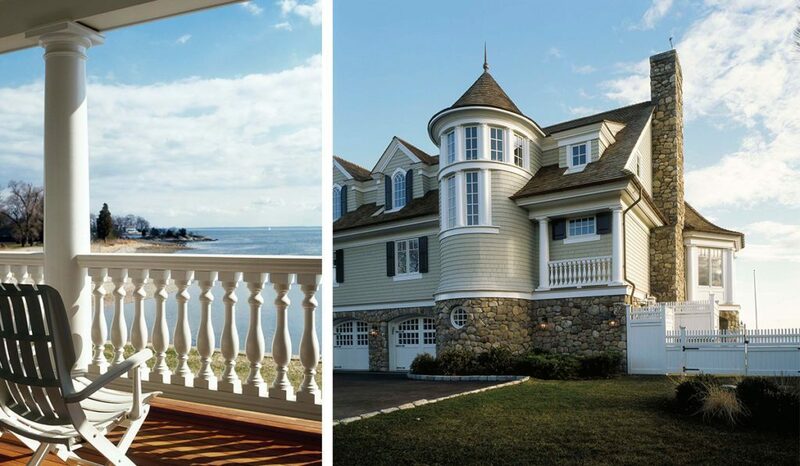 With logistics in mind, take a look at these elegant Fairfield County beachfront homes to inspire your own coastal living experience. 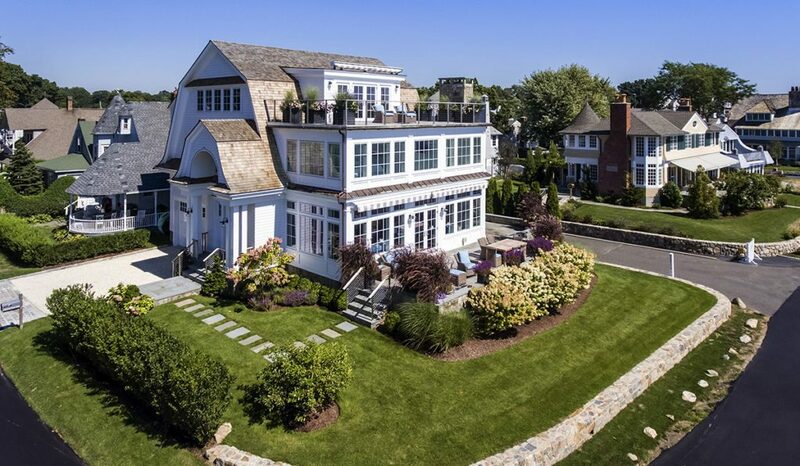 This well-recognized beachfront home sits along Long Island Sound in the Rowayton neighborhood of Norwalk, Conn. This top-to-bottom renovation included new windows, doors, siding, and trim. Cardello Architects also added a slightly sweeping roofline and eyebrow dormers to enhance the views and give the historic house even more character. The exterior view of the home (pictured at the top of this post) is just as spectacular as the views of the Sound from the inside. Cardello Architects’ floor plan for this custom home design on Pratt Island in Darien, Conn., works well for most waterfront properties. The roadside portion of the house is used for circulation and function, while the waterside features the home’s main living spaces. This particular property has two waterfronts on its Southeast corner, making for breathtaking panoramic views of Long Island Sound. 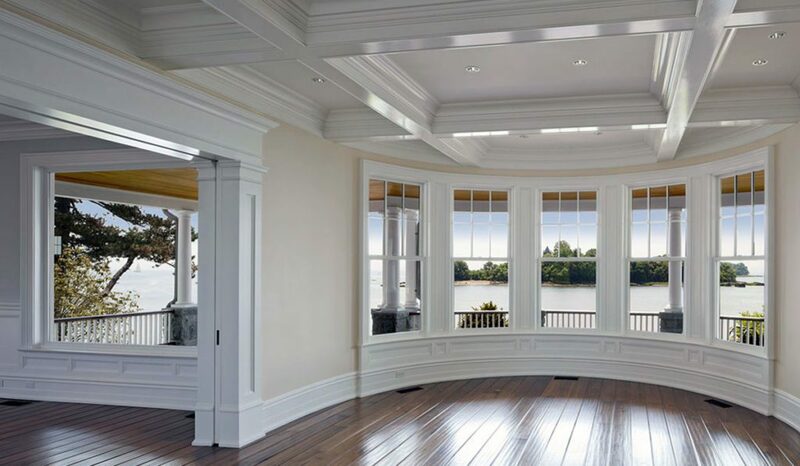 Cardello Architects turned a poorly maintained yet historical home in the Byram section of shoreline Greenwich, Conn. into a gorgeous, Gatsby-like waterfront estate. Exquisite detailing and millwork amplified the home’s historic character. Offering over 10,000 sq. 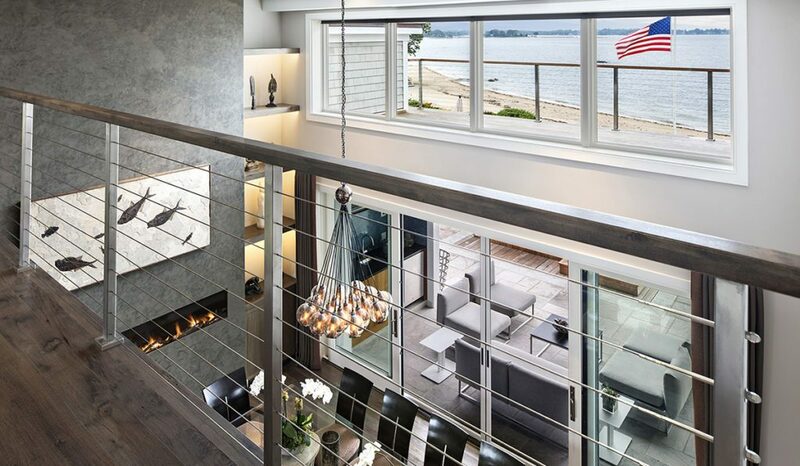 ft., this estate was made for summertime entertaining along the Sound. This Rowayton beach house features a traditional, shingle style exterior that contrasts its sleek, modern interior, which incorporates a 12’ sliding glass wall to the raised terrace. An open floor plan allows the homeowners and guests to focus attention on the home’s serene seaside surroundings. A unique design challenge presented itself with this Cape-style, waterfront home in the Shippan neighborhood of Stamford, Conn. The homeowners wanted update the structure with elements of modern design. Cardello Architects removed the main central fireplace to dramatically open the floor plan. A bridge was developed to connect the north and south wings of the house. While the front of the home maintains traditional Cape Cod-style details, the back exposes the aesthetics of modern home design. Cardello Architects’ mission with this Weed Beach home in Darien was to offer terrific coastal views of from every room. The views of Long Island Sound from both the interior and the outdoor living spaces are beautifully and naturally framed by large peninsulas jetting out from Darien and Stamford. Between the vistas, the architecture and the interior decor, the home takes on a whimsical feel. This charming, historic house needed a small lift to withstand Mother Nature’s potential floods while allowing its inhabitants to enjoy Rowayton’s prime stretch of beach. The three-story home is full of natural light during the day and offers plenty of outdoor living space, including a third-floor deck for whiling away the summer watching the boats sail by.